The Sullivan’s time-tested approach focuses students on the fundamental skills they need for the course: preparing for class, practicing with homework, and reviewing the concepts. The Enhanced with Graphing Utilities Series has evolved to meet today’s course needs by integrating the usage of graphing calculators, active-learning, and technology in new ways to help students be successful in their course, as well as in their future endeavors. In the Seventh Edition, there are several new features that appear in both the text and MyMathLab. Retain Your Knowledge problems offer the type of “final exam material” that students can use to maintain their skills throughout each chapter. MyMathLab is an online homework, tutorial, and assessment program designed to work with this text to engage students and improve results. Within its structured environment, students practice what they learn, test their understanding, and pursue a personalized study plan that helps them absorb course material and understand difficult concepts. NEW! Guided Lecture Notes help students take thorough, organized, and understandable notes during class or while they watch the Author in Action videos. They ask students to complete definitions, procedures, and examples based on the content of the videos and text. Michael Sullivan, Emeritus Professor of Mathematics at Chicago State University, received a Ph.D. in mathematics from the Illinois Institute of Technology. Mike taught at Chicago State for 35 years before recently retiring. He is a native of Chicago’s South Side and divides his time between Oak Lawn, Illinois, and Naples, Florida. Mike is a member of the American Mathematical Society and the Mathematical Association of America. He is a past president of the Text and Academic Authors Association and is currently Treasurer of its Foundation. He is a member of the TAA Council of Fellows, and was awarded the TAA Mike Keedy award in 1997 and the Lifetime Achievement Award in 2007. In addition, he represents TAA on the Authors Coalition of America. Mike has been writing textbooks for more than 35 years and currently has 15 books in print, 12 with Pearson Education. When not writing, he enjoys tennis, golf, gardening, and travel. Mike has four children: Kathleen teaches college mathematics; Michael III teaches college mathematics and is his co-author on two precalculus series; Dan works in publishing; and Colleen teaches middle school and secondary school mathematics. Twelve grandchildren round out the family. 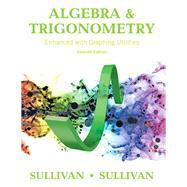 Mike Sullivan III is a professor of mathematics at Joliet Junior College. He holds graduate degrees from DePaul University in both mathematics and economics. Mike is an author or co-author on more than 20 books, including a statistics book and a developmental mathematics series. Mike is the father of three children and an avid golfer, who tries to spend as much of his limited free time as possible on the golf course.